Beautifully engraved uncancelled certificate # P1 from the Winchester Repeating Arms Company issued in 1929. This historic document was printed by the American Banknote Company and has an ornate border around it. This item has been hand signed by the Company’s Assistant Treasurer, Richard Kellers, and is over 84 years old. 1854 Introduction of volcanic repeating handguns. 1856 Offices moved to New Haven, Connecticut. Name changed to New Haven Arms Company. 1862 First Henry rifles are sold. 1866 Oliver Winchester buys control of New Haven Arms Company and changes name to the Winchester Repeating Arms Company. Model 1866 "Yellow Boy lever action introduced -- first gun to bear the Winchester name. 1868 Assets of Spencer Company purchased by Winchester. 1873 Model 1873 lever action introduced in centerfire and rimfire. 1875 Winchester buys rights to Hotchkiss bolt action centerfire. 1876 Model 1876 lever action introduced. 1880 Oliver Winchester passes on. 1883 Model 1883 Hotchkiss Magazine Gun introduced. First Winchester bolt action. 1885 Rights to Model 1885 Single Shot bought by Winchester from John Browning. The first of many Browning designs made by Winchester. 1886 Model 1886 lever action introduced. 1887 Model 1887 lever action shotgun introduced. Model 1887 pump action shotgun introduced. 1890 T.G. Bennett becomes president of Winchester Repeating Arms Company. Model 1890 slide action .22 rimfire introduced. 1892 Model 1892 lever action introduced. 1894 Model 1894 lever action introduced. The 94 is without doubt the most famous of all deer hunting rifles in history. In addition, no rifle came to symbolize the romance of the West more that the Winchester Model 94. 1895 Model 1895 centerfire rifle introduced. Utilizes a box magazine especially designed to accommodate the recently introduced high power smokeless cartridges and pointed bullets. 1899 Model 1890 bolt action .22 rimfire introduced. 1903 Model 1903 semi-auto .22 rimfire introduced. 1911 Model 1911 semi-auto shotgun introduced. The first Winchester semi-auto shotgun. 1912 Model 1912 pump shotgun introduced. Later called the Model 12. 1919 Model 52 rimfire bolt action introduced. 1925 Model 54 centerfire bolt action rifle introduced. 1930 Model 21 side-by-side. Considered the premiere American made double. 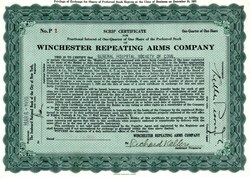 1931 Olin purchases Winchester Repeating Arms Company and combines it with the Western Cartridge Company.